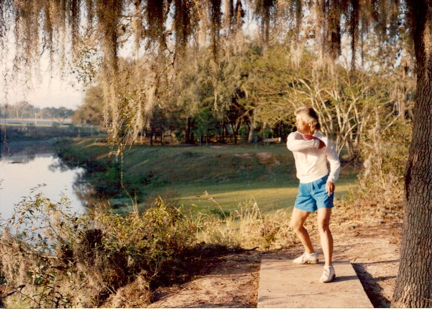 Sylvia started playing in 1984 when her boss (Dr Rick Voakes) dragged her out to the course during a lunch break. She was a typical beginner, but seemed to enjoy the sport, and volunteered to try it again. Over the next few years, Sylvia and Rick fell in love, and also fell in love with disc golf. 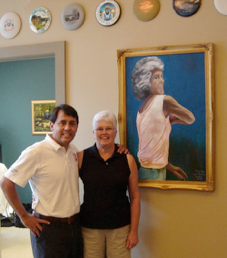 In 1986 Sylvia traveled with Dr Rick to watch the Charlotte Worlds, and she hasn’t missed a single Worlds since. On Jan 1, 1987 Dr Rick and Sylvia were married, after a morning round of 18 holes at Hobson, of course! They have kept up the tradition of playing a round at Hobson on New Year’s Day ever since. Some New Years rounds were pretty cold. Here Sylvia practices putting in the back yard. Sylvia demonstrates her deadly sidearm shot. Sylvia has 66 PDGA titles, and amazingly 51 of them are in the Open Division! 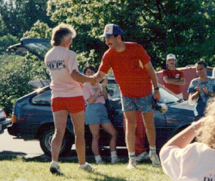 Sylvia starting competing in tournaments in 1989, at age 47. Vanessa Chambers gives a hand to Sylvia after a tournament. Sylvia greatly enjoys being a disc golf spectator as well as a competitor. 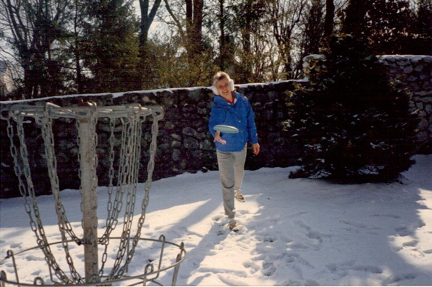 She didn’t even play her first masters division until she was 50 years old (Michigan Worlds ’92). 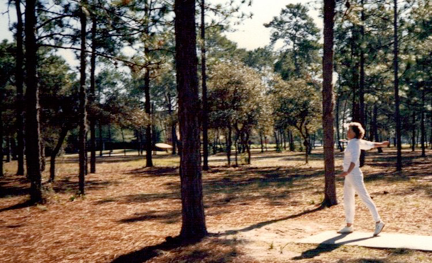 She played Masters at the Worlds in Huntsville ’93, and came in second to (barely 35-year-old) Beth Verish who put in a Hail Mary putt from the edge of OB on the very last hole to win by one stroke. Sylvia took second at the Worlds in ’92, ’93 and ’94. Finally, in ’95 she won her first world title, this time in the OPEN DIVISION ! (Doubles, with Kelly Hughes, Port Arthur, TX). It was a tough field, but with Sylvia’s amazing putting and coaching of Kelly’s powerful drives, they pulled it off. And this was no fluke. Sylvia and Kelly had already racked up two second-place finishes at Worlds Doubles. Sylvia and Kelly Hughes at Women's Nationals, 1993. In ’96 Sylvia finally got to play in her own age division at the South Bend Worlds (well, almost, since she turned seniors age that year), and easily won her first world singles title with a record-setting margin of victory of 52 strokes. In ’97 she picked up another world title, in mixed doubles. Also at ’97 Worlds Sylvia decided to try something new and played against the senior men, coming in fourth place. That year Jim Palmeri beat Sylvia’s record for margin of victory (53 strokes) when he beat up the Senior Division to win his first world title. 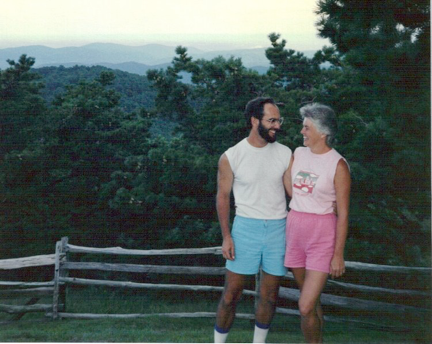 Dr Rick and Sylvia at the Smoky Mountains, on the way home from Bill Boylan's great Laurel Springs tournament. Sylvia always had the reputation for being spotlessly clean during every competitive round. How did she do it? In 1998 at Cincinnati Worlds, Sylvia won the Women’s Grandmasters by 114 strokes, to cream Jim Palmeri’s short-lived record for margin of victory! Sylvia picked up her third singles world title in ’99 at Rochester. She picked up more world titles at Houston ’02, Des Moines ‘04, Augusta ’06 and Highbridge ’07, for a total of seven singles world titles. Actually, Sylvia has won every Worlds that has offered a division in her age group. Unfortunately, that has not occurred very often. 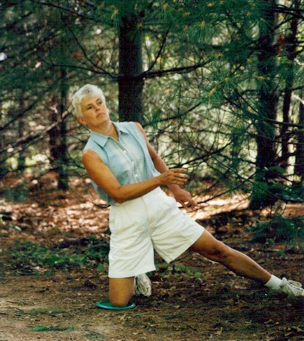 In 2004 Sylvia became the first woman to win a PDGA tournament in the men’s division, by hitting a long putt on the final hole of Clearwater (A-tier) to win by one throw in the Men’s Senior division. Sylvia and Dr Rick befriended a young boy named Kenny at Moccasin Lake who was a "squid" (dove into the lake and pulled out discs). Just 5 years later, Kenny Climo won the Worlds. During her career, Sylvia averaged over 20 tournaments a year, besides doing the 9-5 (actually 8-6, plus evenings) work of three people (managing a busy pediatrics practice) and doing vast amounts of physical labor in renovating a 100-year-old house. She was points leader in the Open division in five of those years, won Open Division Women’s Player of the Year (’93), and was awarded the Jim Olsen Senior Award (’95). Her many Pro Tour titles include some prestigious tournaments. To name a few, Raleigh Dogwood Cross-Town, Minnesota Majestic, Bowling Green Open (x2), Tennessee States (x3), Huntsville Rocket City Open, Augusta Classic, Peoria Open, and Atlanta Tournament of Champions. That’s a bunch of super tour wins (A-tier or above), all in the Open Division! And she won ten of them over the age of 50. Sylvia with Brian Graham at the International Disc Golf Center. Ken Climo welcomes Sylvia into the Hall of Fame, at Pennsylvania Worlds, 2005. 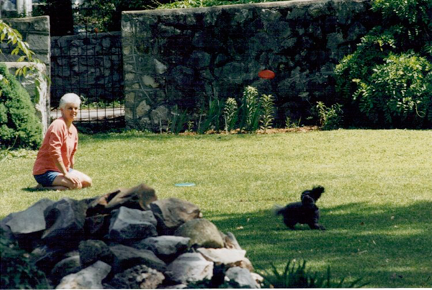 Sylvia's beloved miniature poodle Dexter traveled with her to most tournaments for 17 years, until his death in 2008. And yes, he DID catch that red mini (thousands of times)! 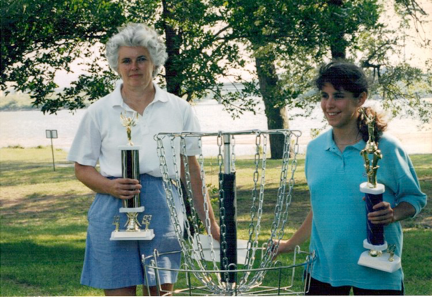 Besides all her athletic accomplishments, Sylvia has given a great deal to the sport of disc golf in other ways. 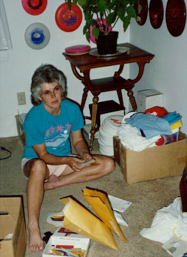 Sylvia was a major driving force behind the Bowling Green Disc Golf Club and Bowling Green Open during its peak years, 1990-2007. Sylvia was keeper of the checkbook for over a decade, while watching the BG Open climb to a $30,000 value tournament, with as much as $17,000 in the pro purse. The Bowling Green Amateur Tournament grew in size to over 750 competitors! Sylvia checked the club's mailbox every day, answered e-mails, and made sure the other club members were doing what they were supposed to do. Getting ready to run a tournament was serious business for Sylvia. 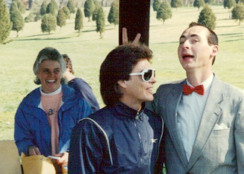 A lighter moment, as Sylvia and "Pee Wee Herman" get a laugh at Dave Greenwell's expense. Sylvia is a constant ambassador for disc golf. She is always generous about giving discs to beginners, and teaching them the basics. One year Sylvia and Dr Rick gave 40 discs to the local high school PE class, and did a disc golf demo at nearby White Park (where the disc golf course was later named after her and Dr Rick). The kids were supposed to play 2 holes, then get back to class, but they couldn’t quit and ended up playing all 18 holes. At another demo, in an elementary school gymnasium, Sylvia was slamming in putts from half-court, which really impressed a lot of kids and teachers. At the medical office, which of course is decorated with disc golf memorabilia, Sylvia fields all the questions about disc golf and tells people how to get started. Sylvia has a serious commitment to disc golf. When she found out about the World Games in Akita Japan, she wanted to be there. She didn’t expect to medal, or even get the chance to play, but she really wanted to be there. She was thrilled to have been picked as an alternate to Team USA, but disappointed not to get to go. She later made the trip to the Japan Open, twice. 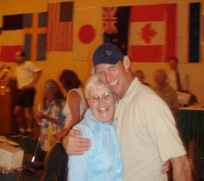 Sylvia is a strong supporter of the PDGA, and served as the Regional Coordinator for Region 5 for several years. Then as Kentucky State Coordinator. 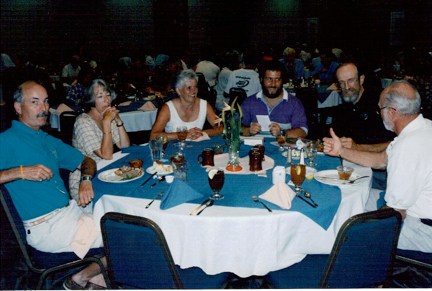 Sylvia exchanges ideas with Cap'n Snap, Annette Conger, John Houck, Dan Roddick, and Steady Ed at the Worlds Banquet, 1995. Some people might consider that a contributing factor to HOF eligibility might be actual “fame”. One measure of that might be the large number of discs that Sylvia has signed for her fans over the years. Here is another measure, in the form of an anecdote or two. Sylvia and Dr Rick were playing Barnett Park in Orlando with Dr Rick’s cousin in the late 1990’s. They were telling him that they were semi-famous in the disc golf world, which he half-believed. About then, a car with Michigan plates slows down, and a young man yells out “You’re Sylvia, right?” Turned out to be a disc golfer from Michigan they had never met before. He left his car by the side of the road, jumped a 6-foot fence, and played the rest of the round with them, reciting tales of fame, and the cousin was duly impressed. Finally, one of Sylvia’s greatest contributions to disc golf is the example she has set for all female (and male!) disc golfers. She always has a positive attitude on the course, and has taught thousands the value of letting a bad shot become history, and moving on to the next shot with a completely fresh point of view. And many is the pro golfer who has been taken aside and given some “straight talk” when deviating from Sylvia’s high expectations (you know who you are! ).